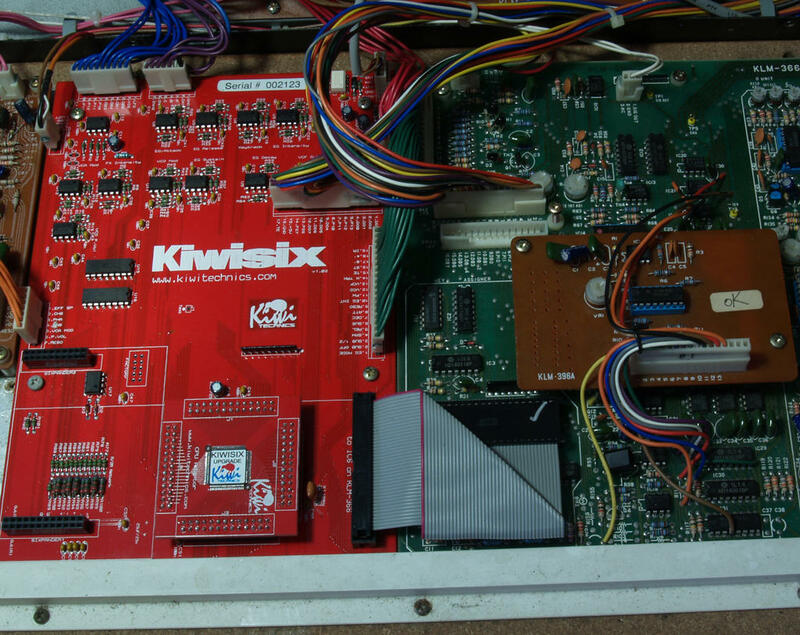 The KiwiSix Upgrade features:- • A complete replacement board for the troubled Korg Polysix KLM-367 circuit board. These are usually battery damaged which can be difficult and expensive to repair and render the synth unusable. • 512 Tones can be stored and edited. 64 Tones come preloaded. It is also possible to temporarily edit any Tone. Tones are selected using a two button system. The first button selects the high digit (bank 1-8) and the second button the low digit (Tone 1-8). This allows 64 tones (1-1 to 8-8) on any bank group. There are 8 bank groups that are selected using the A-D bank buttons. • MidiCC and Sysex support all parameters. Sysex support for Tone Dump & Load and 4096 step parameter control. • NRPN support on all variable controls giving 4096 step control. Release 1.20+ • 4096 step scanning on all front panel controls. Optional Fine midi control using sysex or NRPN (v1.20+) on all variable controls. • Midi In & Out Channels can be separately set. • Patch Editor Control of Parameters (requires PE v 5.0 or later) • Two styles of Polyphonic (7th note override or 7th note ignored) and Last note priority Unison Key Assign Modes • Pedal & Front Panel Button Note Hold modes. Note - using a hold pedal requires a small hardware mod and details are in the user manual v3+ • Internal Master Clock that can be used to clock the Arp and/or Sequence and can optionally generate a midi clock. Master Clock options are Internal, External or Midi. The external clock input is a hardware override of the internal clock • Key transpose allows transposition to any key in a range of 2 Octaves up to 1 Octave down • Internet update system. All future updates will be at no charge. • The Upgrade comes with a replacement metal plate for the power cord. This plate has an IEC socket for a standard power cord (note - Power cord is not supplied), screws and space to mount the Korg Serial Number plate and midi in and out sockets are mounted. An internal cable is supplied to plug into the KiwiSix Upgrade board for Midi I/O. • Optional more reliable power supply using modern components. • Installation instructions are supplied and some soldering is required for the Power wires to the replacement plate and two front panel modifications and also the optional Hold Pedal mod. The power supply upgrade will also need some soldering. Full installation instructions are in the User Manual and any parts required will be supplied in the upgrade. • The Polysix can be a noisy synth. Ferrite clamps have been a proven noise reduction addition and these are provided with the upgrade. • Metal KiwiSix Label CHORD MODE • Any chord with up to 6 notes can be set and played from any key. ARPEGGIATOR • The Arpeggiator can be independently divided from the Master Clock. Clock divide options are Half Note, Quarter Note, 1/8 Note, 1/8 Note Half Swing, 1/8 Note Full Swing, 1/8 Note Triplets, 1/16 Note, 1/16 Note Half Swing, 1/16 Note Full Swing, 1/16 Note Triplets, 1/32 Note, 1/32 Note Triplets, 1/64 Note. • Arp modes are Up, Down, Up and Down, Random, As Played, 1 to 3 octaves • Arp can be Started, Stopped & Continued using Midi Commands • Arp state is saved with a Patch. This allows the Arp to play automatically when a Patch is loaded • Appeggiator will Output Midi Data SEQUENCER • 8 separate 124 Max step Polyphonic sequences can be created and stored (v3+ only) • Sequences can be edited • Sequencer can be Started, Stopped & Continued using Midi Commands • The Sequencer can be independently divided from the Master Clock. Clock options are Half Note, Quarter Note, 1/8 Note, 1/8 Note Half Swing, 1/8 Note Full Swing, 1/8 Note Triplets, 1/16 Note, 1/16 Note Half Swing, 1/16 Note Full Swing, 1/16 Note Triplets, 1/32 Note, 1/32 Note Triplets, 1/64 Note. Got this going on inside your beloved Korg Polysix? Kiwisix Power Supply Upgrade A number of Polysix’s that arrive at our workshop have had extensive damage across multiple boards. It is our conclusion that this has been caused by overvoltage being applied to all the boards. 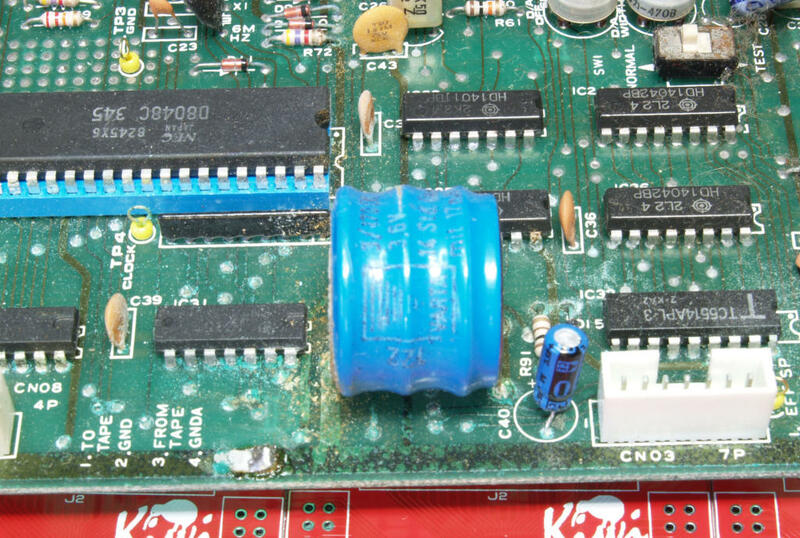 This can only have come from the Power regulating board and because of this we no longer trust the original power regulating circuitry in the Polysix. We have developed the Kiwisix Power Supply Upgrade for the Polysix which uses modern voltage regulators with built in safety systems. Because the failed Polysix’s have proven to be very expensive to repair with extensive chip failures throughout including the SSM chips we strongly recommend also fitting the Power Upgrade. This is bundled at a discount as we feel this is important. 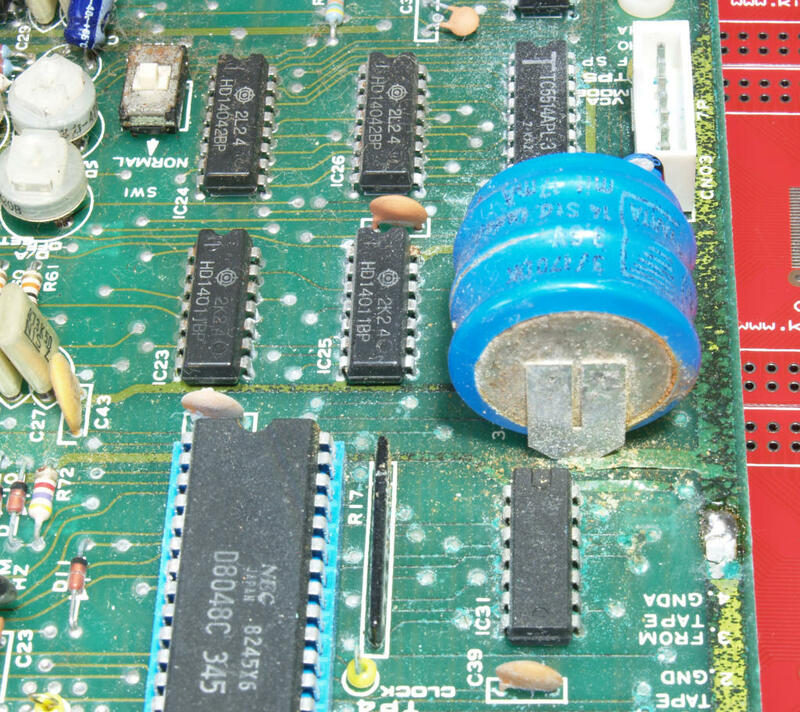 Note - Photo shows finished power upgrade after the old plugs have been moved over from the existing power board. 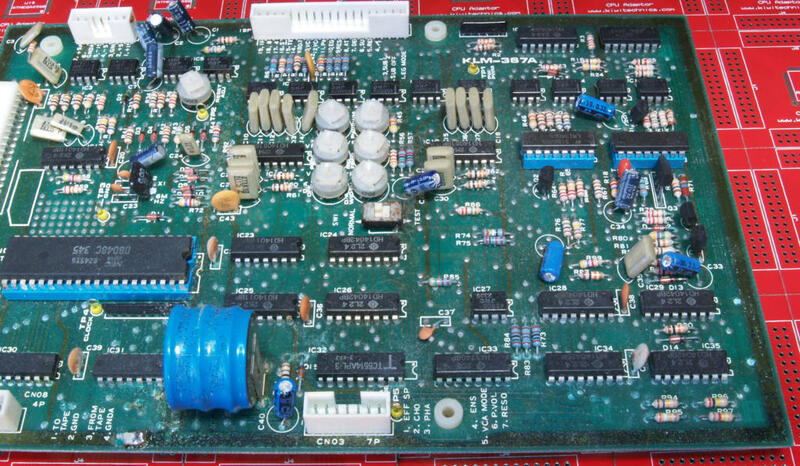 Noise has been a problem with the Polysix and this power board has an area for running a common ground to each audio board. This significantly quietens the Polysix. Details are in the User Manual. Ferrite clamps have been proven to be a help with noise and these are supplied with the upgrade. This transformer has been used and it runs cooler & quieter then the original Polysix transformer. If your Polysix is running hot or you need to change the voltage (e.g. 110v to 230v) then this will work well.